So what to do when you have this one thought that is popping up at night just before you want to go to sleep and it kicks off a whole roller coaster of thoughts that will keep you awake? This is a question that I was asked by one of my clients recently and it is a very typical scenario and I know she's not the only one. For her it is really just before she's falling asleep. She starts to drift off and she has this one thought and it's just like a minefield that is blowing up. For others, it might be in the middle of the night, when you wake up and then suddenly you have this one thought that is making you lose control over everything and you just feel helpless; as your complete mind carousel starts to turn and turn and turn. I want to talk about what is happening but first I’m going to explain to you why these thoughts are keeping you from sleeping. I'm also going to let you know what you can do. I will be giving you three techniques you can apply in order to reduce this. This is helping all of my clients, but of course, you need to implement it. Let's start with point one. 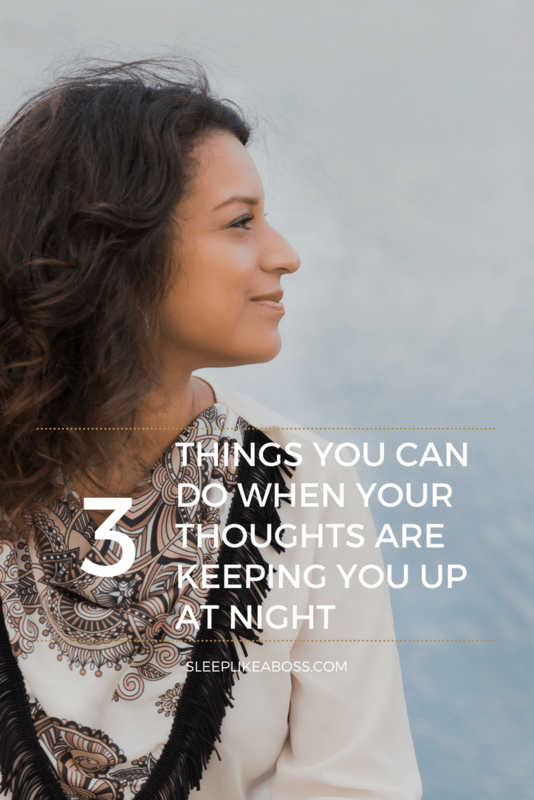 What is happening when I have a thought that is worrying me or creating anxiety and why is it keeping me awake? On the one hand, you really have your logical reason; you're worried, your head is just shooting different thoughts at you and anxiety kicks in. That would be your psychological kind of standpoint. On the other hand, however, we also really need to understand what it is doing to us in a physiological manner. Whenever you have a thought that your brain interprets as stressful; meaning that it is a danger to you in some sort. It might be a deadline where your brain might think if you miss this one deadline, you're losing your job and so forth, which might not be true, but that is what your primitive brain might be interpreting into this. It might also just be a relationship that makes you feel uncomfortable. Anything where your brain feels that it needs to protect you, even from emotional harm, is a stressful event. Whenever we have a stressful event, our body will try to counteract that by helping us by sending out a signal to produce adrenaline and noradrenaline and cortisol. Cortisol kicks in just a little bit later. The first two are what you have in reserve and cortisol is then being produced in order to help you. Cortisol, if you have physical stress, is there to create an anti-inflammatory; it's there to help you become stronger. It focuses on different organs to give you a special kick and that is very helpful. If you are in physical danger however, your brain doesn't differentiate between emotional or physical danger, so the same reaction is being triggered. Why is this a problem? Because cortisol is a stimulant. It is something that keeps you wired and that is when you have this wired but tired feeling or when you are in your bed and you feel this buzz going through your body, even though you are exhausted. That would be cortisol for example. Now, when you have a thought that is triggering cortisol, obviously you have your emotions that are already having a tough time to relax, but then you actually also have your body that is acting up, because it is worried and under the buzz of cortisol. You have two things that are playing against you. This is really important to understand because it's not your fault. That is the most important point you have to take from this little lesson here. 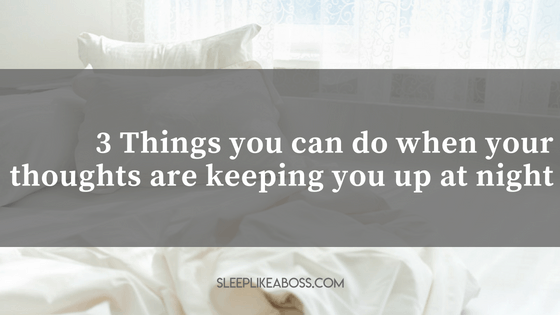 The other thing is when you start sleeping, you start to lift the barriers that you put up during the day to deal with whatever stress is being thrown your way. It might be that it is to censor yourself and your thoughts. A lot of us don't like to have negative thoughts, even about other people. For example, if someone is doing something to you that isn't right, which happens; a lot of us don't want to go there, because we don't want to think what an idiot this person is. We don't like thinking that way. So we try to push it away. Other times it makes us sad or it makes us feel very insecure and we will just shove it away and we will censor it. When we are sleeping, one of the goals or purposes of dreaming for example is to take these elements and to make sense out of them or to help us to work through them. Dreams are a safe zone. It's a playground where your brain and your emotions, your psychology, can play and act out scenarios and it will help us to work through the things that were uncomfortable, sad, upsetting or anything negative during the day or it could also be creative problems or logical problems. Our dreams, are therefore the playground, where we take away barriers and censorship. When you are just about to fall asleep, you are in light sleep, which is kind of a state between being awake and being asleep. What can happen is that those barriers that you have set up during the day are starting to shift and then suddenly you have these thoughts already passing through; but because you're not entirely asleep, it can wake you up and suddenly you have this bottleneck of things that you've repressed during the day, consciously or subconsciously, that are suddenly breaking through and that can be quite overwhelming. That is why these things happen a lot of the time when we are in between awake and sleeping or in the middle of the night. Also when you're dreaming, depending on when you wake up, if you wake up just right after dreaming, you'll be able to remember your dreams a lot more. Even if you don't remember them, it might be that your subconscious does and when you wake up, the thought that is still in your head. Now what can you do? It's pretty simple. You have to diffuse your stress during the day. You can imagine it like a traffic jam with all of these thoughts that weren't looked at during the day, all waiting to pass through the barrier to be looked after. That creates a lot of pressure and it's being released in your sleep or in your dreams. What you can do is to make the street wider and to have the cars trickle through in a way that is manageable. I really like to compare it to taking those cars and to give them a parking space during the day. The cars are your thoughts. You literally take those thoughts. You take them out of your head. You put them in a parking space. You acknowledge them. You don't have to say that they are okay. You don't judge them. You just say, 'I know that you're there. That's okay. I'm going to put you here in this place and we're going to deal with you later or not'. You don't always have to deal with everything straight away, because it can be very upsetting. But acknowledging that it's there and give yourself permission to look at it later, is incredibly powerful. It's really something that I like doing with my clients. It's to start to understand what kind of thoughts are triggering them and are likely to come back to haunt them in the middle of the night. After a while you will understand what kinds of thoughts are typical to come and visit you at nighttime. Whenever something happens to you during the day, where you're like, 'oh, I think this might be something that I have to deal with tonight', just take a breath and say, 'okay, I know you're here. It's okay. I give myself permission to deal with you later' and this later doesn't have to be nighttime. It could be in a couple of hours, when you say, ‘I'm just going to breathe on it for a moment. I'm just going to put it aside and then I'm going to come back to this’. Now, what are you doing when you're coming back to that thought? First of all, it's about asking yourself whether it is legitimately a thought that is legitimately allowed to upset you. Because sometimes we have things that are upsetting us and thinking about it is actually not worth it. It's not true. It really doesn't make sense that it has that much power over us. Take that thought, that event, that comment that you were made and just take that element and ask yourself, 'are you legitimate?' 'Is it okay that you have power over me that way?' Either the answer is yes or the answer is no. When the answer is no, then imagine taking that element like a bubble and just giving it permission to let it go. Take that bubble and just say, 'okay, I acknowledge that you upset me, but it was actually not legitimate'. 'It wasn't true'. Take it and send it off. Imagine taking that bubble in your hands and sending it off. Now what if it is legitimate? It might have been something that was not nice. It might have been your blind spot. It might've been absolutely true and in that case, that's okay too. Then take it. Take that thought and say, 'are you legitimate or not?' And if it's yes, then you have to deal with it. Then you have to try to find out why it is so upsetting you. Can you change something about it? If the answer is yes, then think about what you can do. If the answer is no, if you can't change something about it, then give it permission to let it go as well, because you can't do anything. Wrap it into a bubble and send it off. Give yourself permission not to worry about it anymore. This giving permission element is absolutely crucial. You don't have to worry about everything. If it doesn't make sense, if it's draining you of energy and you can't change anything about it anyway; give yourself permission not to worry about it. If you can change something about it, develop a map, develop a plan, write down what you can do about it and do it better next time. It is going to help you to diffuse that stress, so that it's not coming back to haunt you at nighttime. Another thing that I really like is journaling. A lot of my clients are very empathetic. They don't only feel their own stress, but they feel the stress of everyone around them. What I usually do, is I ask them to keep a journal with them and to write down anything that is upsetting them. It could be a sentence, it could be a word; it could be a complete letter. It doesn't matter. Take that journal, keep it with you and when you are in a traffic jam, when you have a moment in between chores, when you are in between telephone calls, when you have two minutes after lunch to just sit down somewhere and write down a couple of things. Write down anything that is upsetting you and it's literally like taking a magic wand over your head and dragging that thought out of your brain onto paper. It's basically a different process. When we are thinking, our thoughts take the same pathway over and over. It's very difficult to change our thinking just by thinking inside of our head. When you are writing or talking, your thoughts take a different way because they simply need to be expressed differently and that way you literally take them out of your head. It's an incredibly powerful technique that I suggest to everyone who has this typical monkey mind phenomenon. I've seen it help my clients so much. If you are someone, who doesn't like to journal or if it's in the middle of the night or if you don't have someone to talk to about these things; you can also have different techniques. This element of taking things out of your brain and having a catalyst to transform it into something different and parking it during the day, can be very creative. I have a client who is very artistic. She uses clay and produces things with it. You can take molding clay and can transform things with that. You can paint, you can sing, you can create a vision board, which means that you cut out elements of the magazine and put it on a vision board. There's no right or wrong as to how you want to express those stressors. It's absolutely up to you. Number two: You have to diffuse your stress during the day. How do you do this? You don't have to do it straight away, but recognize them and acknowledge them and you can do it before you go to sleep. Do it during the day. Other techniques would be journaling or having a creative outlet, such as sculpting or painting or creating a vision board, for example. Those are things, if you implement them, you will find that your life would change tremendously. You will see that your sleep will become more peaceful. Never forget that it's not just in your head. Most likely it's a combination of headspace and your body being out of whack. That's what holistic sleep is. It is combining your body that's creating a stressor and your mind that can also create a stressor. 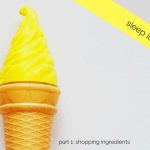 Today we looked at sleep foundations, but don't forget that the five steps 'sleep like a boss' process is looking at foundations, hormones, the thyroid, gut health and nutrition. I hope that this little element or this little lesson has been helpful. Let me know if you have any other questions and I'd love to help. 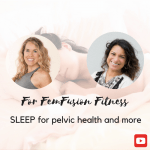 I will talk to you very soon and if you have any questions, just shoot me a comment or write me an email to christine@sleeplikeaboss.com and I also wholeheartedly invite you to take a look at my free video lesson series.